The two South Asian countries are likely to become permanent members of the Shanghai Cooperation Organization at the 2015 summit in Ufa. Heads of government of the 6-member Shanghai Cooperation Organization (SCO) signed documents that pave the way for the entrance of India and Pakistan into the grouping. At the SCO summit held on September 11-12 in the Tajik capital of Dushanbe, the grouping also agreed to consider Iran’s request to become a full member. 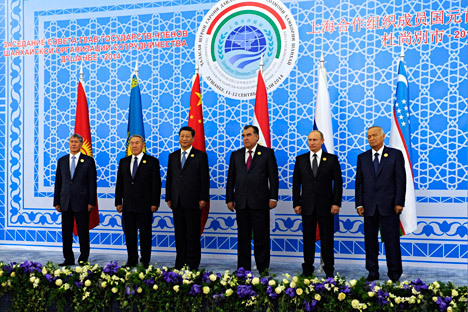 The SCO’s Dushanbe summit was expected to be historic. A number of prominent political analysts had predicted that the organization would open up to new members. However, expansion was set aside while the situation in Ukraine took centre stage. The SCO members essentially backed the Russian position on Ukraine and said that they voiced support for continuing talks in the country. The Shanghai Six lauded the signature in Minsk of a cease-fire agreement and came out in favour of the Russian president’s achievement of a peace initiative. Russian presidential aide Yuri Ushakov told the Russian media that at this time the expansion of the alliance is still premature in light of anxieties related to the well-known acrimony between India and China, and India and Pakistan, and the sanctions against Iran. These factors could weaken the alliance. However, the expansion has not been forgotten. Russia, which took over the SCO chairmanship from Tajikistan, figures that in the coming year, the organization’s expansion process will truly take shape, said Russian president Vladimir Putin. According to Putin, among other priorities of the Russian chairmanship are strengthening the role of the SCO in providing regional security, launching major multilateral economic projects, deepening cultural and humanitarian ties and producing comprehensive approaches to current global problems. He also said that an SCO development strategy until 2025 will be prepared in time for the next summit. Commenting on the summit of the SCO members’ heads of state, Alexander Knyaznev, an expert on Central Asia and the Middle East, told RIR that throughout its history, the organization has not been particularly quick to develop. “The complex make-up of the members, where China dominates economically, Russia has great political influence, Uzbekistan and Kazakhstan are relatively self-sufficient and Kyrgyzstan and Tajikistan act based on how the mood strikes them prevents the body from adopting effective solutions,” Knyaznev said. “Since decisions in the SCO are made by consensus, from year to year there remain unresolved issues, such as the acceptance of new members. At the Dushanbe summit, documents regulating the acceptance of new members were renewed, but Iran, which was the most prepared of all the applicants for membership, will again be left out of the SCO due to sanctions that are still in effect.” He is sceptical about the statements that mention the possibility of accepting India and Pakistan as full members at the Ufa summit. “In its foreign policy, India continues to grow closer to the United States and the Western bloc as time passes, while Pakistan is turning into a battleground between the United States and China for influence,” Knyaznev said. Knyaznev added that an interesting intrigue could “come to pass” with Mongolia: in addition to the issue of building a Russian-Chinese gas pipeline through Mongolian territory, visits by Russian President Vladimir Putin and Chinese President Xi Jinping to Ulaanbaatar for a trilateral meeting on the margins of the summit most certainly touched on more general topics related to Mongolia’s strategic direction of development. Also interesting was the meeting between Uzbekistan’s president, Islam Karimov, and his Iranian counterpart, Hassan Rouhani, considering both the long-time stall in bilateral relations and the revival of tieS that has begun to take shape in recent months. Given that Nursultan Nazarbayev hosted Hassan Rouhani in Astana just before the Dushanbe summit, it is possible that the two leading governments of the Central Asian region—Kazakhstan and Uzbekistan—are trying to use for their own advantage the “sanctions pause” against Iran. Russian political analyst Alexei Martynov told RIR that “it is important that the next planned SCO summit take place and prove that the SCO has succeeded and truly takes action as an organization of interregional cooperation.” He believes that one of the most important outcomes of the Dushanbe summit was the discussion of the issue of dedollarizing the economies of the alliance’s members. “With Russia and China’s active support of the trend, it is completely realistic. This will undoubtedly irritate the United States, just as the very existence of the effective format of the SCO irritates them,” Martynov said. He said that another significant moment of the Dushanbe summit was the unanimous appraisal of the situation in Ukraine—Russia was not alone in its course of opposition to the West.